Teething can be extremely uncomfortable for babies. Here are some tips to help bring your baby some relief during teething. Remember when your wisdom teeth came in? Not too comfortable, was it? Well, imagine how your baby feels when her whole mouth is going through that! No wonder she’s grumpy. 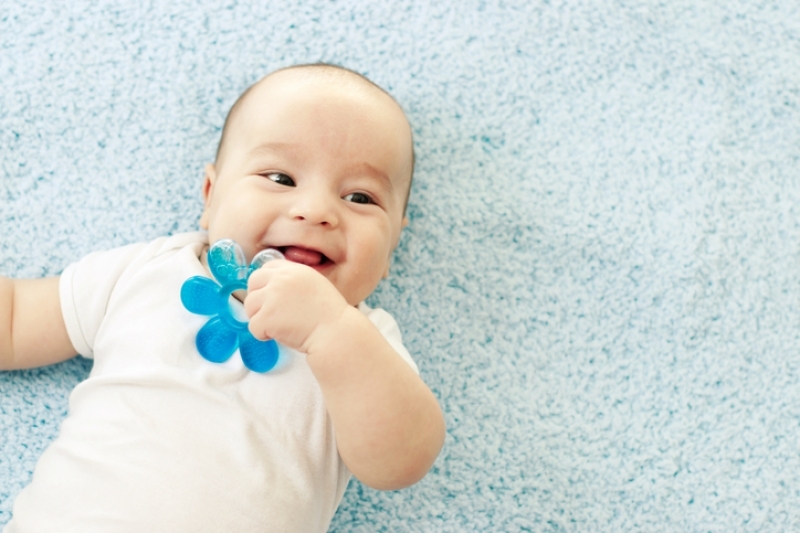 The following tips will help your baby feel more comfortable during teething. Using a cloth moistened with cool water, or just your (clean) finger, gently massage the gums. This counter-pressure can really help ease your baby’s discomfort. Provide something cool for your baby to bite. A cool washcloth, a spoon or a teething ring (like this Batman one!) will help bring down inflammation and soothe at the same time. You can keep a stockpile of these items in the fridge so that they’re available at a moment’s notice! If your baby is on solid foods, try offering a chilled carrot or cucumber for him to gnaw on. Just be sure to supervise while your baby is chewing on anything edible. During teething, babies drool a lot! Keep lots of soft clean clothes on hand and dab the drool away often, to prevent skin irritation. You can also apply a moisture barrier, such as Vasaline, to keep some of the moisture off the skin. There are several options available: acetaminophen (Tylenol and similar) or ibuprofen (Advil, Children's Motrin, etc.) might help. Need some more advice on caring for your teething baby? Get in touch with SmileTown Langley today to book a consultation with on of our pediatric dentists.